Healthway Medical, the country’s most-preferred and trusted mall-based clinic expands its reach by catering to global markets through its partnership with I-Remit, the largest Filipino-owned non-bank remittance service provider. The venture allows Healthway Medical to offer its premium healthcare services to more than 2.2 million Overseas Filipino Workers (OFWs) and other Filipinos abroad through I-Remit’s iShop. Considered a “One-Stop Shop Delivery Service”, iShop accepts orders and coordinates the delivery of Pinoy gifts and pasalubong from Filipinos abroad to their respective beneficiaries and loved ones back home. “By making our healthcare services available online, OFWs and foreigners can take care of themselves and their families without having to worry about being far away from home,” says Carmie de Leon, Healthway Medical Vice President for Sales and Marketing. Healthway Medical will now be offering Health Screening services as well as its premium executive checkup package, HealthCheQ International, to over 1,400 remittance outlets located in 26 countries and territories covered by I-Remit. 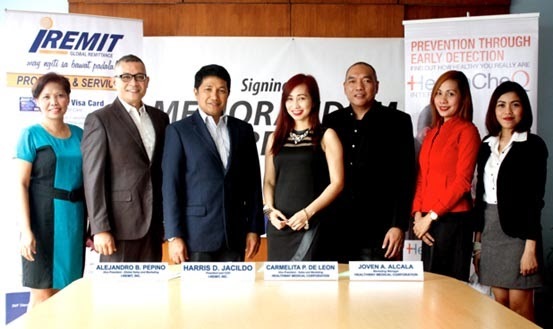 In photo are (L-R): Luzviminda Nietes, Healthway Medical Manager for New Business; Alejandro Pepino, I-Remit Global Sales and Marketing Vice President; Harris Jacildo, I-Remit President and CEO; Carmie de Leon, Healthway Medical Vice President for Sales and Marketing; Joven Alcala, Healthway Medical Marketing Manager; Jennifer Saclolo, Healthway Medical Alternative Distribution Channel Head; and Naome Lucernas, Healthway Medical ADC Officer. Healthway Medical’s Health Screenings provide diagnostic procedures that help determine diseases even before the onset of observable symptoms. This enables Healthway Medical’s healthcare professionals to apply preventive health procedures and easily treat conditions before they get worse. Among the health care packages offered are basic medical exams for male and female, diabetes screening, and dental services such as teeth whitening. HealthCheQ International, on the other hand, offers a more comprehensive medical package that includes laboratory, diagnostic services, imaging studies, and special examinations. Available in transferrable coupons, HealthCheQ International is designed to provide medical and dental services for the entire family. The package also allows patients to choose among tests and procedures that best suit their needs, including cosmetic services such as warts removal and other facial-care procedures. On top of premium healthcare, Healthway Medical extends its exclusive service with a complete wellness experience by offering an overnight stay at any of Healthway Medical’s partner hotels or resorts for a relaxing getaway. For more information, visit Healthway Medical clinics at Alabang Town Center, Festival Supermall, Greenbelt 5, Market! Market!, Robinsons Place Manila, Shangri-La Plaza, and SM North Edsa-The Block. Call the Customer Care Hotline (02)751-4929 or visit www.healthway.com.ph. Like Healthway Medical on Facebook.